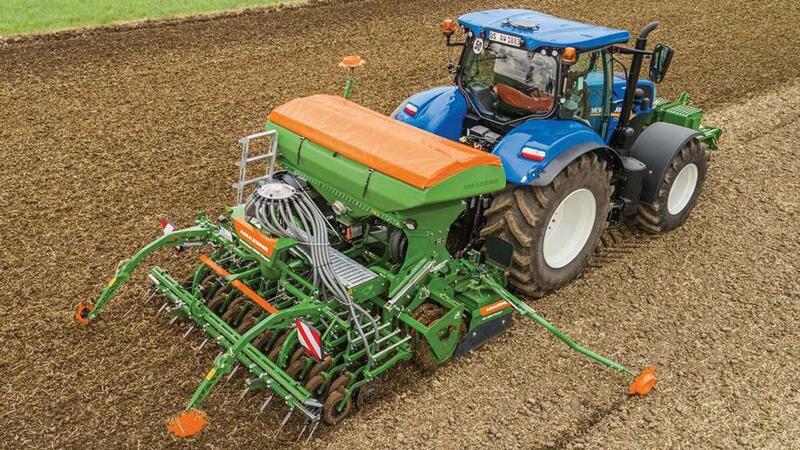 With the power harrow still hugely popular north of the border, manufacturers at the Royal Highland Show will have a good selection of combination drills to inspect. Part of a big display of new drills on the Amazone stand, the three-metre Centaya offers a high specification drill combination with the firm’s KG or KX 01 power harrows. A plastic seed hopper has been developed to reduce the lifting power requirement of the outfit, while the distribution head has been repositioned above the coulters to bring the centre of gravity of the 1,600- or 2,000-litre hopper forward. A new operator station, using the company’s Twin Terminal 3.0, groups all the controls to the left side of the drill for ease of calibration, which can be achieved without returning to the cab. The seed metering housing has also been spun through 90-degrees for easier access to the cassettes on the electrically driven system. Seed is distributed using a new segmented seed head which is mounted directly over the coulters, with half-side shut off to allow the GPS SectionControl to switch the drill down in 1.5m sections in short work. Priced at £47,750, the show machine will feature TwinTec double disc coulters, an Exact double row harrow, hydraulic coulter pressure adjustment, work lights and KWM wedge ring roller on the power harrow. 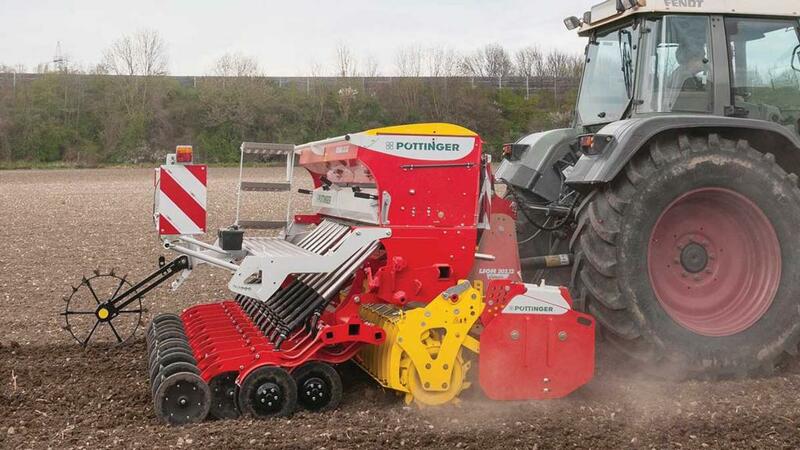 Pottinger will show the Vitasem A range of seed drills, designed to offer ease of use and seed metering accuracy in a cost-effective package. 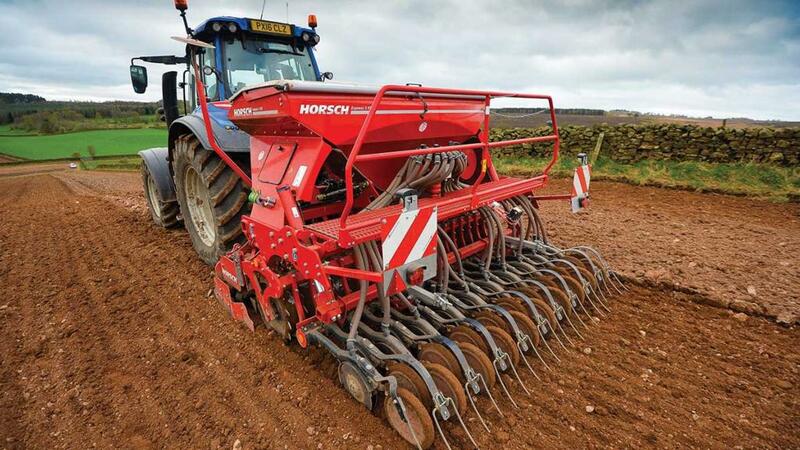 Available for use in combination with Pottinger Lion power harrows or Fox combination cultivators, these gravity-fed drills can be used in plough-based or min-till regimes. Hopper capacities are from 1,000 litres, with the lid opening to 103-degrees allowing easy filling with big bags or a bucket. Multi-sowing seed wheels are designed to allow easy switching between small and large seeds, says the manufacturer, using two separate groups of metering pegs – moving a slide on the seed outlet swaps between seed sizes. All adjustment is carried out at the setting centre located on the left side of the drill. There is a choice of the firm’s Dual Disc, single disc or three row Suffolk coulters, with coulter pressures of up to 50kg per coulter; row spacings of 12.5cm or 15cm can be specified and working widths are 2.5-4m. Available with either mechanical or IsoBus-compatible electric metering, the Vitasem range’s controllers can be specified to suit the desired application. Prices are from £9,940 for a Vitasem 302A with Suffolk coulters. From the Kverneland stable, the recently launched e-drill Compact and e-drill Maxi, which fit to Kverneland’s power harrows and seedbed preparation machines, will be on show. The Eldos electrically-driven metering unit offers five rotors for various seeds, accessed on the left of the hopper. Calibration is carried out by remote control. Sowing depth can be adjusted centrally via spacers on the two hydraulic cylinders without tools, and the coulter bar can also be lifted out of work. Coulter options include the established CX-II disc coulter at a row distance of 12.5cm. Working widths are from three to four metres. The drill is mounted on the power harrow via a parallelogram linkage allowing adjustment of the cultivating depth without affecting the sowing depth. Hopper capacity is 1,000 litres on the e-drill Compact, with the e-drill Maxi offering up to 2,000 litres. An electronic low level sensor, adjustable from the outside, monitors seed flow. The hopper is mounted directly on the headstock, reducing the lifting capacity requirement. The coulter bar can also be removed for solo operation of the power harrow. Prices are from £20,422 for a 3m e-drill Compact. 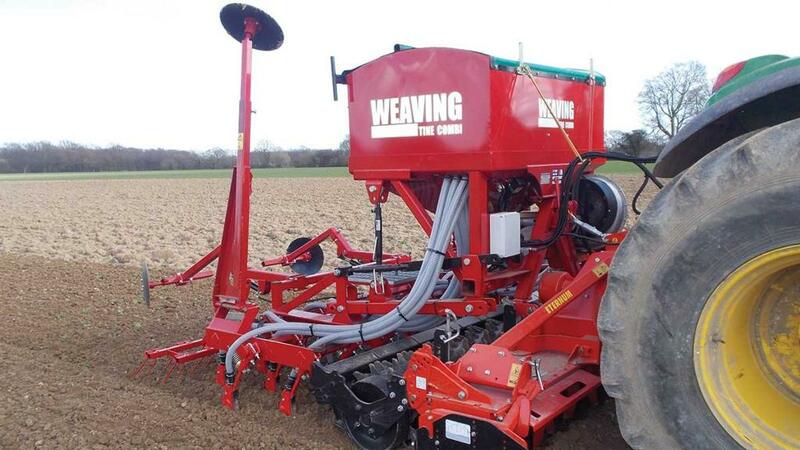 Weaving Machinery’s power harrow tine/disc drill combination is sold without a power harrow, allowing a customer to use an existing unit or buy one of their choice. The Combi drill comes with a choice of three rows of auto-reset tines with two rows of following harrows, two rows of heavy-duty double disc coulters with rubber depth wheels and a single row of following harrows, or two rows of Rotec disc coulters and single row of harrows. 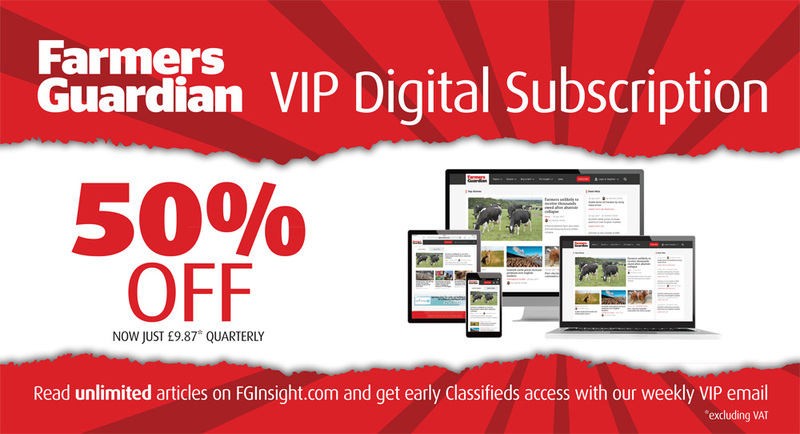 Metering is via an RDS Artemis Lite GPS-compatible unit and the 1.5-tonne hopper is mounted on an A-frame with demount legs for easy removal from the harrow. Working widths are three and four metres and prices are from £9,400. On the Horsch UK stand will be the Express KR, the company’s first pneumatic drill with a powered tillage tool, the Kredo integrated rotary harrow. Designed to work under testing conditions, the Kredo has 10 rotors on three-metre models, which can be equipped with drag or TerraGrip quick change tines. It also offers fine adjustment of the working depth and a choice of packer. Available in 3m, 3.5m and 4m working widths, the Experess KR uses the TurboDisc coulters from Horsch’s Pronto drill to follow the soil surface for consistent seed depth. Four rubber dampers per coulter transfer a coulter pressure of up to 120kg for accuracy at higher speeds. The TurboDisc seed coulters can be lifted completely on the hydraulic rams allowing the Kredo rotary harrow to work on its own. It can also be uncoupled completely from the drill via four fixing points. The drill element is fitted via a special frame which allows the power harrow to be adjusted without affecting the sowing depth. The seed hopper is positioned close to the tractor enabling units from 150hp to handle the outfit. Available in grain only or grain/fertiliser versions, control is via the Horsch IsoBus terminal. The Express 3 KR on show is priced at £43,820. Offered for the first time as a three-metre model, Kuhn’s latest Venta 3030 + HR 3040 combination seed drill uses straight blades and a Duplex gearbox on its HR 3040 power harrow, enabling rotor speed to be adjusted according to soil conditions. Featuring a 1,800-litre seed hopper, the Venta seed drill uses a fluted metering unit with a choice of splines for larger or smaller seeds. Seeding rates can be set from the tractor cab from one to 430kg per hectare. Precise seeding at up to 15kph is achieved via a speed sensing radar and it is possible to shut-off every second row for special applications. Kuhn’s Seedflex coulter bar uses widely offset double discs mounted on a parallelogram to work in conditions from ploughed to min-tilled land. Following press wheels control seeding depth and ensure soil to seed contact. 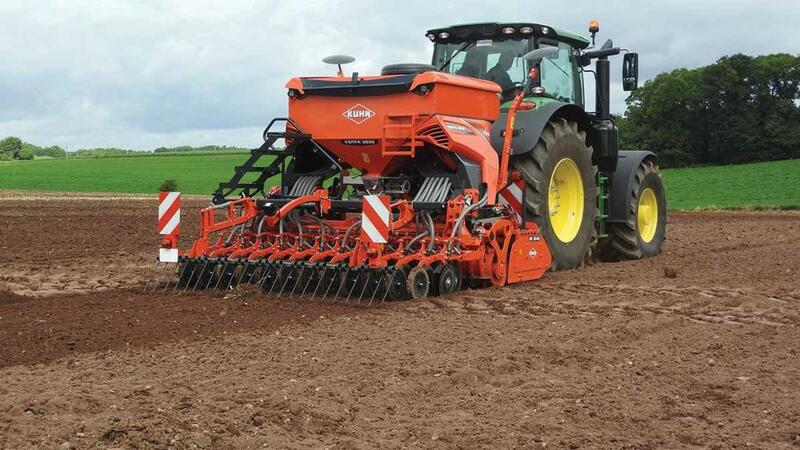 Tillage and seeding are carried out independently using a roller frame design which allows for a more compact unit and enables the two units to be uncoupled in less than 10 minutes, says Kuhn. The Venta 3030 + HR 3040 is suitable for tractors with a power output of up to 300hp. Prices are from £46,402. 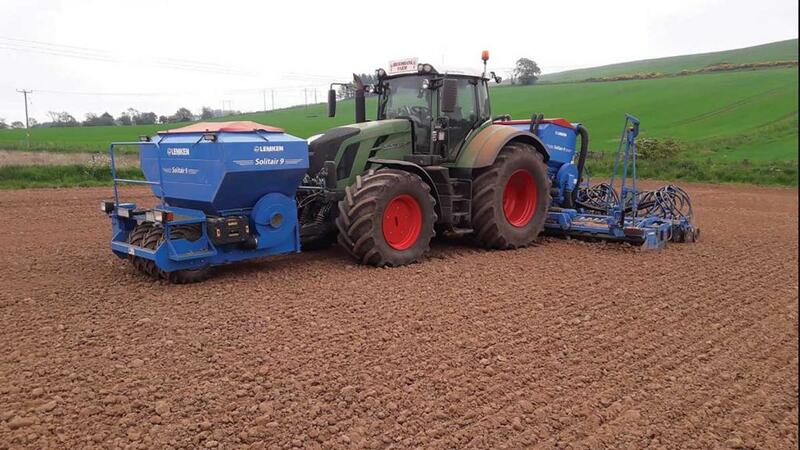 Lemken’s Solitair 9 and Zirkon power harrow combination offers the unusual layout of a folding four- or six metre toolbar with rear mounted tank. A front mounted tank can then be added for combination grain/fertiliser seeding. On the Solitair 9, the central metering unit’s six cell wheels can be set to seeding rates between 1.5 and 300kg per hectare for sowing different types of seeds. Seed distributors are located outside thw seed hopper, directly above the coulter bar. A trapeze roller immediately ahead of the double disc coulter unit presses in line with the following coulter, with areas in between not consolidated, designed to enable the coulters to open the furrow accurately. The OptiDisc double disc coulters have depth control wheels with rubber tyres to place seeds precisely, even in variable soil conditions, says the manufacturer. A new control option is the CCI 1200 IsoBus terminal, which has a larger display and can be used in portrait or landscape format. The screen can also be split to display two functions at once, for example guidance and drill operation. 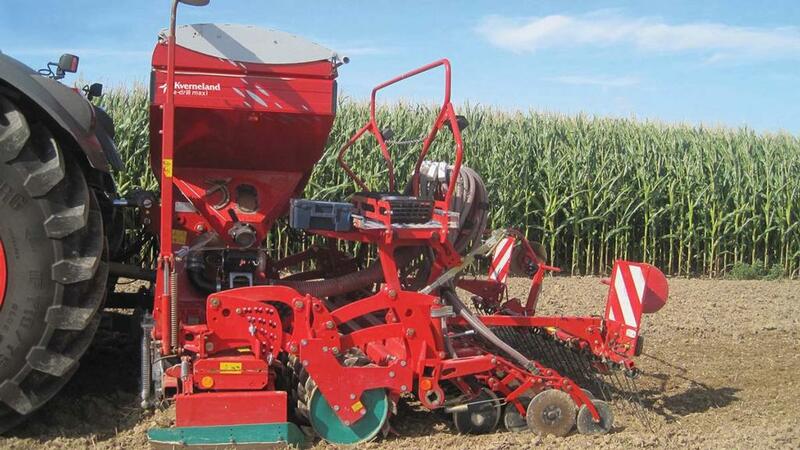 A 6m combination is priced at £96,500 with full IsoBus technology and the ability to place seed and fertiliser. 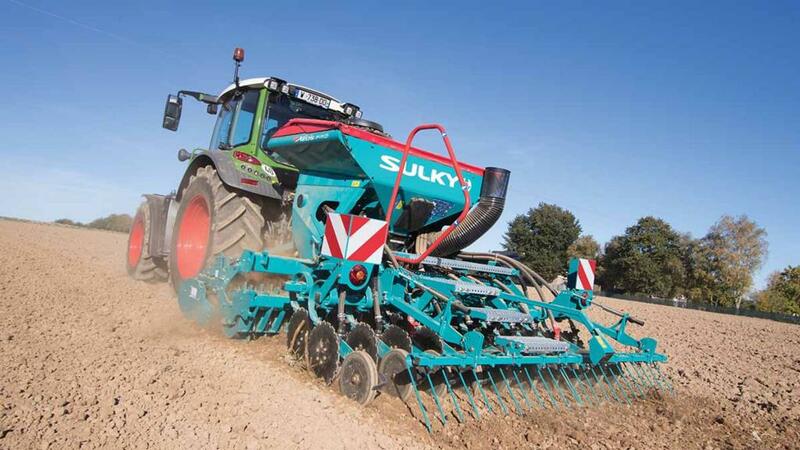 Sulky is exhibiting its Xeos Evo combination, a three-metre drill capable of drilling 20 or 24 rows. It is fitted with the 80kg Cultidisc drilling toolbar, with two rows of coulters spaced at 56cm for trash clearance and mounted on a parallelogram. The Xeos Evo is designed to work in a wide range of conditions, from minimum tillage to drilling after ploughing. Lighter than its predecessor by 400kg and fitted with a 1,000-litre hopper, the new compact build is said to increase manoeuvrability. It can be fitted to a Sulky Cultiline HR power harrow with four rotors to the metre or to a Sulky Cultiline XR disc cultivator and the two tools can be quickly interchanged when conditions deteriorate. The retail price of the outfit on show is £48,290.